Lot Detail - Chuck Rayner's 1951-52 New York Rangers Game-Worn Wool Jersey with Family LOA - Team Repairs! - Photo-Matched! 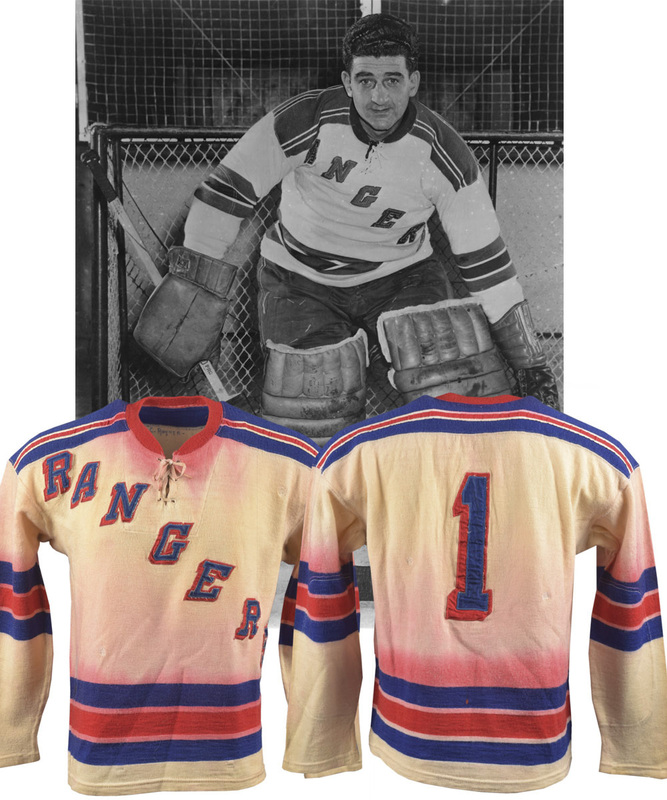 Chuck Rayner's 1951-52 New York Rangers Game-Worn Wool Jersey with Family LOA - Team Repairs! - Photo-Matched! Serving as the last starting backstop for the ill-fated New York Americans during their final season in Brooklyn in 1941-42, Chuck Rayner spent the next three years with the Royal Canadian Navy during the war before embarking on eight seasons with the Blueshirts beginning in 1945-46. Considered by Gordie Howe to be one of the toughest goaltenders to beat during his legendary career, Bonnie Prince Charlie earned the Hart Trophy in 1950, taking the Rangers to overtime in Game 7 of the Stanley Cup finals. After suffering a knee injury and losing his job to a young Gump Worsley in 1953, Rayner would guard the crease of the Saskatoon Quakers for a single season in 1953-54, before his final 8 games played, spread over two seasons with Nelson in the WIHL. Ranked No. 16 on the all-time list of New York Rangers in the book 100 Ranger Greats, Rayner would compete in three NHL All-Star Games, with Hall of Fame enshrinement occurring in 1973. We have a vintage New York Rangers wool sweater that was worn by the Sutherland native during his second-last season in Manhattan, in 1951-52, with this especially desirable specimen photo-matched! A label from supplier Gerry Cosby graces the inner seam along with a size “50” fly tag, with “C. Rayner” handwritten in blue within the collar. Styled with the iconic “Rangers” placed diagonally across the chest in individual layered drop-shadow tackle twill letters, the sleeves are void of any numbering, with “1” over the verso in matching material. With six eyelet configuration on tie-neck construction, the familiar red and blue striping accents have also been utilized over the sleeves and lower band, with additional affixed white and red accents over both the front and reverse shoulders. The garment’s colouration remains rich, with the red and blue sections retaining their vibrancy, with considerable bleeding and saturation to the cream-coloured sections beneath the front neckline, above the front and reverse lower band and atop the sleeve’s striping bands. There are also a few tiny holes present including within the reverse lower band and near the right elbow, with diminutive dime-sized team repairs over the front, sleeves and on either side of the reverse number, with some minor pilling over each cuff and beneath the front collar. An included numeric image has been matched to the team repair in black threading situated within the upper blue striping band over the left sleeve. Vintage wool sweaters that saw action in The Big Apple during the Original Six era don’t surface often, especially specimens worn by prominent Hall of Fame goaltenders. An LOA from the Rayner family will accompany, and please take note that this item may be subject to a silent reserve.